Individually insulated drawer compartments ensure contents of unopened drawers are protected even if one is left open. 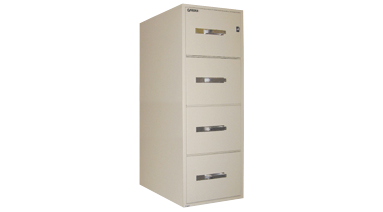 Lock bypass sytem allows user to choose which drawers are locked when the push lock is engaged. UL® 350 certified 1-hour proven fire protection. 4-Drawer. Legal size. 19-3/4"W x 25"D x 54"H. 556 lbs. Beige. 5-year parts, 1-year labour and lifetime after fire guarantee. Unique ball-bearing carriage suspension ensures smooth operation and minimizes swaying. .